Movement is the foundation of life and without it, we and all other vertebrates would perish. We move our feet to get us to where our hands (or a horse’s hooves) need to be, in order to eat or do other tasks essential to our survival and well-being. If we agree that movement is the essence of our lives, this foundation might very well lie where you might expect it: at the bottom of our feet, or in the case of the horse, the hooves. Thus, understanding body alignment starting with the feet, together with the extensive intricacies of fascia, holds unbelievable untapped potential. Unfortunately, most of 21st century humans will not tap this potential, having trapped their feet in shoes along with the rest of their bodies. As soon as we could walk, our parents put us in shoes, and because of our shoe-wearing culture, most people never get to feel the array of sensory information that the earth has to offer. Most conventional footwear is narrower than the natural foot. Shoes can be rigid, thick-soled or have elevated heels which make it impossible to access the full range of motion of many joints. Perhaps, the same may be said of the shoes that horses wear. Are we trapping our horses in shoes that restrict movement of structures within the foot? (In no way does this question determines whether horses should be shod or not. Some horses will never hold up to barefoot for conformational or pathological states. This is an issue for a later discussion.) However, if there is any contraindicated restriction in the foot, the body then, by way of the fascia, has to make constant adjustments to the pelvis and spine to try to maintain functionality. Have you ever witnessed the power of fascia, and its utter ability to change for better or worse? As an experiment, try this neat party trick! Ask a friend to do a forward bend or “Uttasana” as it is called in yoga practice, and evaluate their range of movement. Most people will have difficulties touching their toes. Now, ask them to slowly and firmly roll their plantar fascia with a tennis or golf ball for one minute on each foot. Re-test the forward bend. For most people, you will find at least a moderate to a profound increase in the range of their forward bend and relief of the tightness in the posterior line of the body, from hamstring to lumbar spine to neck. How is this possible? The answer can only be found within the fascial system. In this case, the tennis ball underfoot massage has released the superficial fascial back line (as identified by Tom Meyers in his book, Anatomy Trains). Did you know that the human foot, has 33 joints and up to 7,000 sensory nerves, without counting the foremost fundamental fascia? It turns out that fascia is one of our richest sensory organs, with between six to ten times higher quantity of sensory nerve receptors than the muscles. In fact it is possible that fascia may be equal or superior to the retina, which has been considered so far, the richest sensory organ. All of this neurological information would get mobilized, if we were walking on natural varying terrains and surfaces. Because shoes are restrictive and our feet, most of the time, are only exposed to a flat and smooth ground, the joints become immobile, the muscles atrophy to a certain extent and the fascia stiffens. Proprioception in feet or hooves is indeed, essential for correct functional movement. Proprioceptors are the sensory organs located in muscles, joints and fascia that provide information to the Central Nervous System (CNS), regarding posture and function of the body. All of the tendons, ligaments and joint capsules in the feet or hooves are technically fascia and anatomical science has proven that fascia is richly endowed with proprioceptors. So, when there is biomechanical dysfunction, there is inaccurate neurological information that is sent to the CNS from the feet. This can have a detrimental effect on coordination and balance through the spine and pelvis. For example, when people wear thick cushioned shoes, and there are a few inches between the foot and the ground, the likelihood of twisting the ankle increases dramatically. This is because, by the time the proprioceptors in the foot realize it is twisting, it is already too late and damage is done. Whereas if barefoot, the proprioceptors would have acted instantaneously in correcting the balance and avoided injury. Most footwear changes the natural shape of our feet, and by extension, changes the function of our entire body. However, even if we were barefoot most of the time, the artificial surfaces we usually step on, are flat, predictable and unchallenging for our proprioceptors. Our bodies have lost both the ability to adapt to different terrains and the physical competency to achieve the natural skills of walking, running (for our lives), lifting, crawling, throwing, catching or climbing. All of these innate movements demand high levels of adaptability. Our bodies have sadly become a prime example of our cultural lack of movement! Horses are suffering from the same issues, in as much as, they are not allowed to roam over a wide variety of terrains, the way feral horses traveled. Horses spend most of their time in stalls or manicured paddocks. We try to work them on the best surface available and without much change in terrain, or gaits. Hence, the critical importance of riding them outside the arena, and also doing work through mazes, cavalettis, TTouch exercises, etc, to wake up their somatic abilities. We find that many performance and even a lot of pleasure horses are shod in a way that severely decreases the proprioception of the feet. 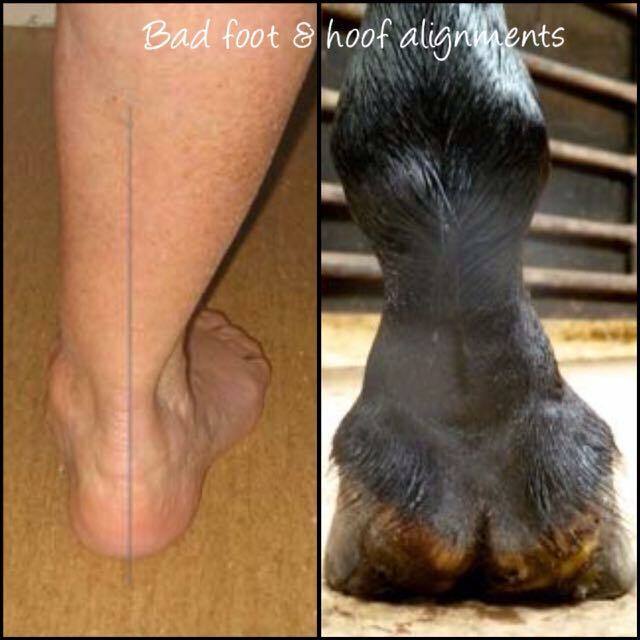 In our practice, we see too many bad fitting shoes being put on horses feet without proper posture and gait analysis, and not paying enough attention to the medial-lateral balance. By the end of the shoeing period, the fascia has locked in the postural defects, only to be repeated over the months or years to come, unless the feet balance is corrected. The fascia, should then normalize. However, if the problem is long standing, there is no point in correcting the feet without addressing the fascia concomitantly! This may also require straightness training and postural rehabilitation to bring the fascial structures back into balance. Proprioception in barefoot horses is indeed much better. But if the feet are not trimmed evenly and the hoof-pastern axis and medial-lateral balance are not addressed, we will find the same postural problems than in shod horses. As a result, they develop a system of compensatory patterns that will bring the dreaded domino effect into a very clear perspective. Medical science for better or for worse, is finally catching onto the importance of fascia, as a major player in every movement that the body makes. If under tension, physical or mental, it will create knots, restrictions or pain that will impede your horse’s ability to exercise its full range of motion. It will thus enforce the body tendencies to either restrict itself and shorten, or lengthen and destabilize. 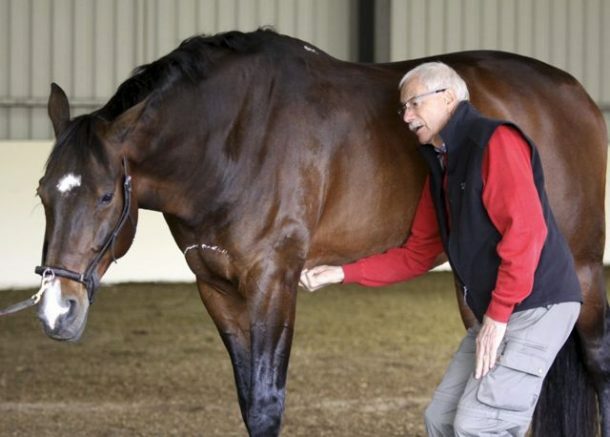 Remember, that the horse will react to trauma, repetitive physical strain or mental stress and create muscular or structural rigidity in its fascia. We know that it will lead to impaired functional movement. On the other hand, when the fascia is normalized, and of proper viscosity and tension, the body then can align with gravity and joints can move freely. 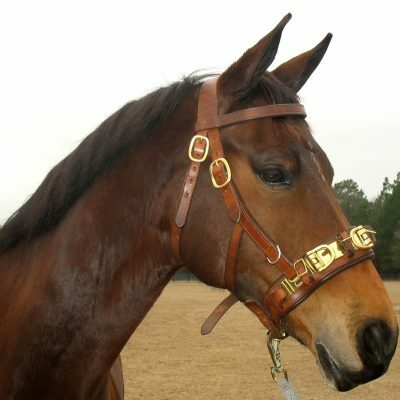 Next time you are at the barn, stand your horse on a flat surface and pay attention to every detail from the tip of its nose to the bottom of its feet. Stand back and observe its posture. Check the alignment of the hoof-pastern axis and the medial-lateral balance of each foot. And last but not least, make sure that its barn and work environments are stress-free!